CLIFTON BEACH, CAPE TOWN - DEC 2005 - View of Clifton Beach with Lions Head in the background. A popular beach with holiday makers, tourists and locals alike. Here some beach goers are playing rugby. sd00:27CLIFTON BEACH, CAPE TOWN - CIRCA DECEMBER 2005 - View of Clifton Beach with Lions Head in the background. 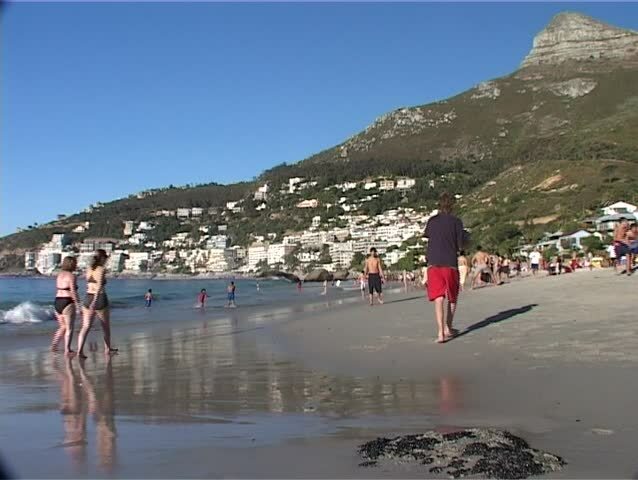 This is a popular beach with holiday makers, tourists and locals alike. hd00:27HONG KONG - CIRCA JUNE, 2014: Children and adults relax on the Repulse Bay Beach in the evening on a weekday. Repulse Bay Beach is a tourist attraction in Hong Kong, it is located on Hong Kong Island. 4k00:23PHUKET - MARCH 9, 2014 : Timelapse of unidentified visitors at Patong beach during sunset. hd00:24RIO DE JANEIRO - CIRCA 2013: Copacabana beach, Brazil: Copacabana is an upscale neighborhood located in the south of the city of Rio de Janeiro.